Point of View: Which manager should move jobs? 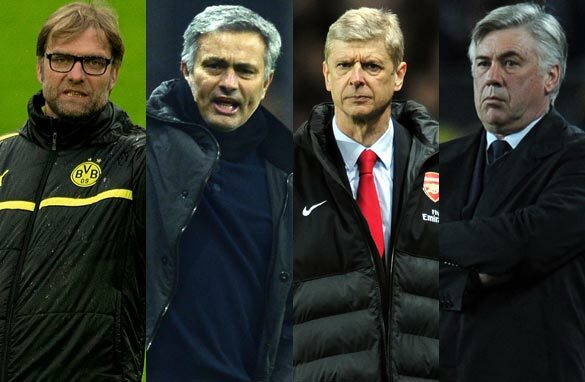 Jurgen Klopp, Jose Mourinho, Arsene Wenger and Carlo Ancelotti could all be on the move. (Getty Images). No sooner had the final whistle blown on the semifinal victory by Borussia Dortmund over Real Madrid, than speculation swiftly turned to whether this was also the final whistle on Jose Mourinho’s career at the helm of the Spanish giants. Never one to miss a trick in tantalising the press, the self-dubbed "Special One" shaped the narrative of the media response to the defeat by suggesting in post-match interviews that he “might not be” in charge of Los Meringues next season. It doesn’t take a genius to work out that Mourinho is hinting at a return to former club Chelsea, the London side he steered to two English Premier League titles. Madrid has notoriously high standards of success and it is plausible to think that failing to secure “La Decima” has done for one of the most decorated coaches in modern times. This is just one scenario of course, built on nothing more than journalist tittle-tattle and theories cobbled together from crumbs of truth; however, the potential domino effect across Europe could be remarkable. In the modern day Champions League, a small elite group of multi-lingual managers have emerged – able to coach high-profile clubs in different nations – and the big moves of the close season will undoubtedly involve them. Also Arsene Wenger will coach PSG beginning next summer, which is a great coach, which could get a balance at PSG between the expensive great players in the squad and the new talents I'm sure he will discover also at PSG. I guess Ancelotti will go to Real but I don't see a bright future for him there, because for me he's not a great coach. Managerial merry go round will happen this summer.Klopp to Arsenal,Wenger to PSG,Ancelotti to Real,Jose to Chelsea,Mancini future unknown.Busy transfer window ahead for managers. Jurgen Klopp, Jose Mourinho, Arsene Wenger and Carlo Ancelotti are squad builders. Big names ! The coming two decades are theirs. All the best. Wenger = Phony. Inherits great sides and trashes them. When the talent departs, he gets exposed as the phony he is. Personal to Eric Onacea: How'd that Klopp at Man U work out?! Personal to Eric Onacea: How'd that Barca comeback vs Bayern work out?! Oh, that's right, it didn't! If the tax evasion story on Messi is true, Barca might be finished. Because without him, who's the finisher? !